HyNoon Kiwanis Storm the Lake Triathlon (2019) - AllSportCentral.com - Registration. Results. Relax. 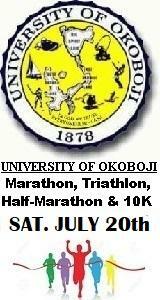 The 9th annual Hy Noon Kiwanis Storm the Lake triathlon is a charity event for Storm Lake Kiwanis Projects for Youth. Join other athletes at beautiful Storm Lake, IA King’s Pointe Waterpark and Resort. Swim in the protected bay, bike around the lake and run along the lake finishing at the flower lined path. All transition areas are at the waterpark. Storm Lake is considered one of the most beautiful venues for a triathlon. The entire route is well marked with yellow vested Kiwanis volunteers cheering the athletes and providing assistance all along the way. Location: King’s Pointe Resort and Waterpark, Storm Lake, IA. Storm Lake is 60 miles east of Sioux City, IA, 135 miles north of Omaha, NE, 140 miles northwest of Des Moines, IA, 140 miles southeast of Sioux Falls, SD on highway 71. This is a USAT sanctioned event and participants are required to purchase a one day or annual membership to USAT. Also, come to enjoy Wood, Wine and Blues for the weekend in Storm Lake. Chain saw artists, wine tasting and great Blues Band. A full day of great entertainment awaits! Your participation helps a wonderful cause! Proceeds to help the High Noon Kiwanis raise funds for their children's and youth projects. Packet pick up Fri. from 6:00-8:00 p.m. at King's Pointe Lodge and again at 6:30 a.m. Sat. morning at Awaysis Beach at King's Pointe. Shirt size/availability is guaranteed if registered by Aug. 7, extra shirts will be available after that date, but sizes not guaranteed- they will be distributed at packet pick-up, first come/first serve. All participants will receive a medal. Come on and try the Storm the Lake triathlon! A beautiful venue for a triathlon. NOTICE: This is a USAT sanctioned event! As a participant, you MUST have either an Annual USAT Membership (bring USAT card) OR purchase a one-day membership while registering online for $15. NOTICE: EACH ADDITIONAL MEMBER of your team MUST also have either an Annual USAT Membership (bring USAT card)or purchase a one day membership for $15 (cash/check only - day of event) at packet pick-up. If you are the Team Captain and you have already paid for the team you should not be required to pay any extra. You should also be able to add shirt sizes for your other team members. NOTE: You MUST use the athlete account that you used when you registered the team you want to edit otherwise you will not have access to that TEAM ROSTER.